In northern Portugal, the Douro River curves through the terraced vineyards of Douro wine country, a World Heritage-designated region celebrated for its spectacular beauty and centuries-old viticulture. Step back in time in medieval villages, examine world-renowned rock art, and cross into Spain to roam the Renaissance streets of Salamanca. Along the way, taste excellent wines in the cellars of Porto and historic countryside estates, and listen to traditional rhythms of fado and flamenco in spectacular settings. Historian Franklin Knight is the Leonard and Helen R. Stulman Professor Emeritus of History and Academy Professor at Johns Hopkins University. His research interests focus on social, political, and cultural aspects of Latin America and the Caribbean, especially after the 18th century, as well as on American slave systems in their comparative dimensions. His analyses of Latin American and Caribbean issues have been aired on National Public Radio, the Voice of America, the British Broadcasting Corporation, the McNeill/Lehrer Report, C-Span, and elsewhere. Franklin has held fellowships from the Social Science Research Council, the National Endowment for the Humanities, the Center for Advanced Study in the Behavioral Sciences, the Ford Foundation, and the National Humanities Center. A past president of both the Historical Society and the Latin American Studies Association, Franklin served as academic consultant to the television series Columbus and the Age of Discovery, The Buried Mirror, Americas, Plagued: Invisible Armies, Crucible of Empire, and The Louisiana Purchase. He was elected Corresponding Member of the Cuban Academy of History in 2012. For more than a decade, Krista Rossow has worked as a photographer, photo editor, and educator for National Geographic. She began her career as a photo editor at National Geographic Traveler magazine, where she shaped compelling stories from world-class imagery. As a freelance photographer she has shot feature stories for Traveler in South Africa, Costa Rica, and cities around the United States like New Orleans and San Francisco. She regularly judges Instagram contests for @NatGeoTravel and photo edits for National Geographic Books. Krista travels with National Geographic Expeditions teaching photography around the world–from the Galápagos Islands, Patagonia, and Morocco to Alaska, Antarctica, and the Arctic. She enjoys traveling and photographing throughout Europe as well, and she sees the camera as a tool for understanding new cultures, meeting the locals, and exploring the natural world. Her images are represented by National Geographic Creative. Tim Weed is an outdoorsman and award-winning author with a long career in international education. A founding director of National Geographic Student Expeditions, he has also directed college semester abroad programs in Spain, Australia, and Venezuela; brought some of the first American students to post-Revolution Cuba in the late 1990s; led travelers through Portugal, Spain, and Patagonia for National Geographic; created and led programs for writers, artists, and musicians in Spain, Cuba, Argentina, Italy, and Ireland; and trekked the Andes in four countries. Tim has authored two books, and his articles on travel, history, outdoor adventure, and the writing craft have appeared in Talking Points Memo, Backcountry, Writer’s Chronicle, National Geographic’s Intelligent Travel blog, and other publications. His is the winner of a Writer’s Digest Popular Fiction Award and a Solas Best Travel Writing Award. A founding director of National Geographic Student Expeditions, Tim Weed is an outdoorsman and award-winning author. He has authored two books, and his articles on travel, history, outdoor adventure, and the writing craft have appeared in Talking Points Memo, Backcountry, Writer’s Chronicle, National Geographic’s Intelligent Travel blog, and other publications. Originally from Italy, Gianluca Colla has traveled and photographed around the world, from the Arctic to the Antarctic Circle, from Africa’s deserts to the Amazon and to the Alps. He has covered a diverse range of topics including the secrets of the longest-living centenarians in the world, a lost Da Vinci painting, and hidden mummies in Sicilian crypts. His work has appeared in numerous publications, including National Geographic magazine, Condé Nast Traveler, the New York Times, and the Washington Post. Currently based in Switzerland, he has traveled and photographed extensively around Europe. Arrive in Porto, a World Heritage-listed city straddling a gorge on the Douro River. Embark the Scenic Azure and enjoy a welcome reception and dinner on board. On a walking tour of Porto’s historic old town, explore medieval treasures, examine famous azulejo tiles, and stroll the waterfront. Visit the Palácio da Bolsa, the city’s old stock exchange, and gaze at the gilded Moorish motifs coating the walls of its Salão Árabe—or Arabian Room. 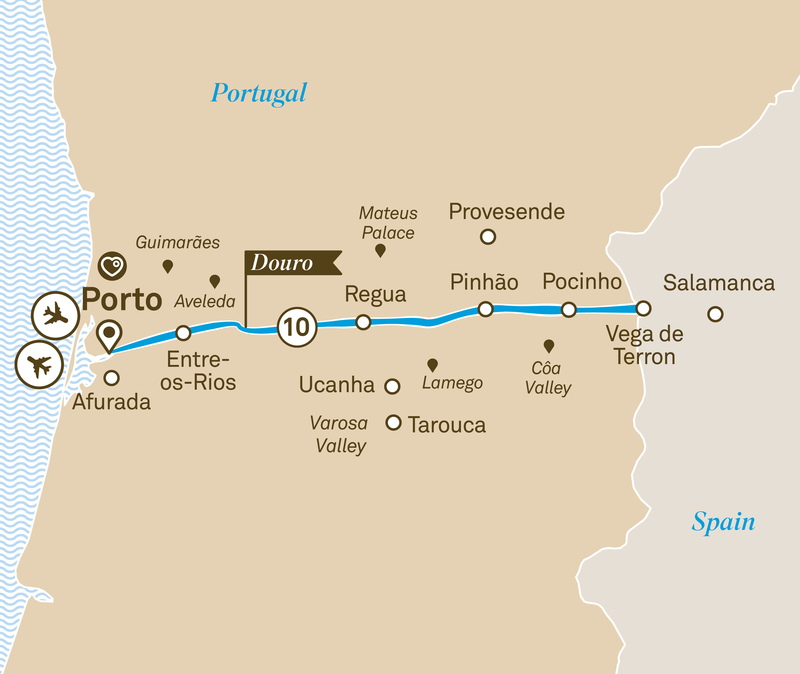 This afternoon we begin our cruise along the Douro, tracing the river through the rural landscapes of northern Portugal. Delve into history at the Palace of the Dukes of Bragança in Guimarães, Portugal’s first capital and the birthplace of its first king, Afonso Henriques; or venture to the stunning Quinta da Aveleda winery and gardens in the Vinho Verde wine region, where we’ll sip on this producer’s famous sparkling whites. En route to the site, stroll the Ponte de Ucanha, a fortified medieval toll bridge, then wander the abandoned monks’ quarters and restored church. Alternatively, choose to tour the elegant town of Lamego, home to a stunning baroque staircase leading to the Senhora dos Remédios pilgrimage church; or join a guide to explore the opulent Mateus Palace, famously featured on bottles of Mateus rosé. Take in scenes from the Douro Valley from the comfort of the ship lounge as we wind our way past the charming terra-cotta-roofed towns and vine-striped hillsides that earned the region its World Heritage designation. Enjoy the amenities on board, including a plunge pool, fitness center, and expansive sundeck. Cross into Spain for a visit to Salamanca. Take in the city’s Renaissance splendor on a guided city tour, then enjoy some time to explore on your own. Gaze at façades of golden sandstone, soak in the grandeur of the Plaza Mayor, and see the pair of cathedrals that crown the city. Enjoy lunch in town, with live entertainment from flamenco dancers before a visit to the historic university in the afternoon. Venture into the Côa Valley and visit the Côa Museum to learn about the prehistoric rock art at the World Heritage-listed Foz Côa, where thousands of stone carvings created over thousands of years have been found. Opt to ride a 4x4 vehicle to the archaeological site, and set out on a hike to view these fascinating carvings. You may instead choose to paddle a canoe along the pristine Sabor River, a rugged tributary to the Douro that has remained virtually undeveloped. Or set out on a culinary excursion to the Casa Painova estate and taste their delicious almond and olive products. Later, visit the Quinta da Roêda estate to try their famous ports and, if you wish, walk among the vines for a special al fresco tasting. This evening, head to Porto’s Igreja de São Francisco for a private concert in this baroque church’s spectacular gilded nave. Set out on an extended walking tour from the edge of town into the reserve, spotting birdlife amid the salt marshes. Meet fishermen returning with the day's catch along the way, and sample fresh sardines grilled on an open fire. There are also options today to visit Porto’s oldest canning factory, or go for a tasting in one of the city’s most celebrated port cellars. Enjoy a final breakfast on board, then transfer to the airport for your flight home. Explore the wetlands at the edge of Porto on a morning walk, looking for birdlife and meeting fisherman as they pull in with their catch. Attend on board photo talks led by a National Geographic photographer, and practice landscape shots on the sinuous vineyards that flank the Douro. Enjoy a festive flamenco performance in Salamanca and a private concert in the spectacular gilded nave of Porto’s Igreja de São Francisco. Starting in Lisbon, enjoy a three night stay before taking in the delights of the Douro on an all-inclusive, luxury cruise of the idyllic Douro Valley.